The preparation of thin films of YBa2Cu3O7 -δ by magnetron sputtering of stoichiometric targets has been described in the literature. 1 - 8 We have obtained high-quality superconducting films with the onset of the resistance drop (Fig. 1) at 95 K and have obtained zero resistance at 85-89 K for oriented SrTiO3 substrates, at 82-85 K for MgO substrates, and 75-79 K for silicon substrates with a buffer layer of ZrO2 by means of magnetron sputtering using a system shown diagrammatically in Fig. 2. The sputtered target was a ceramic disk of composition YBa2Cu3O7 -δ of diameter 40 mm and a thickness of from 2 to 4 mm, which was attached by a silver contact to the cathode. The total pressure of the argon -oxygen mixture with an Ar/O2 ratio between 3 and 10 was maintained at 0.2 to 0.4 torr and was monitored by means of a movable-electrode gas-filled tube with an accuracy of 10%. In addition, the rate of flow of argon directly into the discharge space was monitored, as was the supply of oxygen at a distance of several centimeters from the substrate. It was shown that to obtain high-quality films the rate of flow of argon from the magnetron must exceed the order of magnitude of 104 cm/s. The magnetic system ensures a stable annular discharge with a ring diameter of 25 mm and a width of 6 mm. 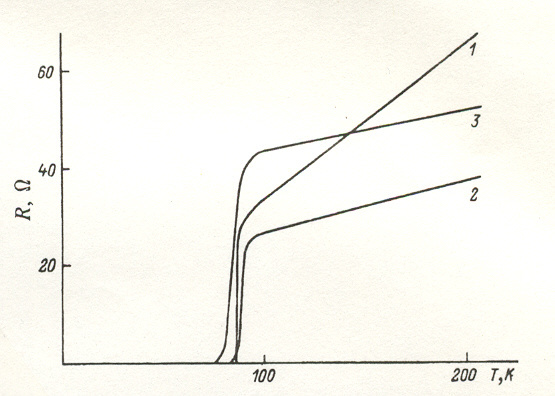 In steady-state discharge the discharge voltage lies between 140 and 160 V. An increase in the discharge voltage indicates that either the resistance of the target is increasing because of heating and the reduction of its oxygen content below that which gives it its high conductivity, or because of the pulverization of the anode ring, as a result of which the voltage drop at the anode increases. The substrates were positioned at a distance of 22 to 28 mm from the target on a heater 9 consisting of a high-alumina ceramic into which a platinum or a nichrome wire was impressed at a temperature of 1200°C. The temperature of the substrate was monitored with a Pt/Pt+ l0%Rh thermocouple attached to a control substrate, which allowed measurement of the true substrate temperature during the deposition with allowance for the thermal barrier between the surface of the heater and the substrate in vacuum, which was usually found to be in the range 200-300°C. The temperature of the substrate surface during the deposition was maintained in the range 650-750°C with the film deposited at a rate of 1.5 - 5 nm/s. After admission of oxygen to a pressure of 1 atm the sample was saturated with oxygen at a temperature of 550°C, with subsequent cooling to 400°C at a rate of about 5 degrees per min. Deviations from these technological parameters resulted in irreversible degradation of the film quality. It is of interest to analyze the technological conditions of the deposition of single phase coatings for the purpose of creating a theoretical basis for a systematic optimization of the apparatus configuration and the technological conditions in formulating the problem of obtaining high-quality films on substrates having dimensions of the order of a square decimeter and greater. FIG. 2. Temperature dependence of the resistance of YBaa2Cu3O7 -δ films prepared by magnetron sputtering onto a substrate of SrTiOj (1), MgO (2), and Si, with a protective coating of ZrO2 (3). where ci(x) is the concentration of the ith component of the target at a distance x from the target and Di(x) is the diffusion coefficient of the ith atom. where ci(∞) is the concentration of the ith component sufficiently far from the target surface and is equal to the initial concentration in the target under steady-state conditions. Since the value of Vetch is the same for each species of atom, it can be said that for the steady-state case the ratios of the fluxes of the evaporating atoms correspond to the initial composition of the target. If the target is replaced or if the discharge current is changed it can take several hours to reestablish a steady-state discharge regime characterized by a steady-state distribution of the atoms in forepart of the target surface. A suitable criterion for the establishment of steady-state conditions is the attainment of a constant discharge voltage. An important technological factor that permits attainment of the steady-state regime of sputtering is good thermal contact between the target and the water-cooled cathode, which can be obtained by the use of silver contact paste. If the thermal contact is poor the target is heated by the discharge and the diffusion rate then increases exponentially and above a certain temperature can exceed the rate of sputtering, and as a consequence it is not possible to achieve a steady state at all. At the time of the sputtering of the target a groove is formed in the discharge region with a configuration that determines the geometry of the emission of the target atoms. As the target is continually operated the width of the planar bottom of the groove, which permits the atoms to be emitted perpendicular to the plane of the target, decreases in size and finally disappears altogether, after which the cross section of the groove takes the form of a semicircle. At this point in time the rate of transport of atoms to the substrate falls off abruptly and the stoichiometry of the deposited film is perturbed to the extent that a new target is needed. The characteristic time that a target with a 6 mm groove can be used at a current density of 2 nm/s before it must be replaced is 100 h.
The target atoms ejected by argon ion bombardment have an energy of the order of 1 to 10 eV, which is much greater than the energy of thermal motion, 0.02 eV. As a result of collisions of these atoms with argon atoms the former lose energy, and when their energy is close to the thermal energy there is a transition from directed transport of target atoms to random transport obeying the laws of diffusion. Depending on the energy of an atom that reaches the substrate, it can interact with the substrate surface in various ways, from being incorporated into the crystal structure to being reflected or even causing secondary sputtering of the target surface in the case of especially high-energy particles. Let us consider the transport of sputtered high-energy atoms from the target to the substrate. where (θ is the angle of separation in the center-of-mass coordinate system of the colliding particles. FIG. 3. Statistical curves of the reduced distance traveled by yttrium atoms in argon until they have lost 90% (I), 99% (2). 99.9% (3), and 99.98% (4) of their initial energy. FIG. 4. Transport coefficients (I) and the fraction of atoms that have lost no more than 90% of their initial energy (2) during magnetron sputtering as functions of the reduced distance. where d is a random quantity taking on values uniformly distributed in the interval from 0 to 1.
where σ is the collision cross section equal to σ = π(R + r)2, n is the concentration of atoms in the scattering gas, and l is the mean free path, equal to λ = 1/(nσ). in the present case, where non-head-on collisions are also taken into account, the average thermalization distance is 4-6 Lmin, and complete thermalization occurs at a distance of 12 - 14 Lmin. After thermalization the transport of atoms occurs by diffusion, and in the case of the model where the target and substrate are two infinite parallel planes the probability of deposition of an atom on one of them is inversely proportional to the distance of the plane from the position of thermalization. where lth is the distance an atom travels before thermalization and L is the spacing between the target and the substrate. Using formulas (3)-(6) and (8) we can calculate the transport coefficient of atoms of various species under conditions that are characteristic of real deposition. According to Danilin, 11 bombardment by argon ions transfers to the target atoms 5 to 10% of the energy of the bombarding ions. With a discharge potential of 150 V the energy of the sputtered atoms is estimated to be 10-20 eV, while their energy of thermal motion at 500 K, which is the characteristic temperature in the region of the discharge, is 0.02 eV (i.e., 10-1 % of the initial energy). 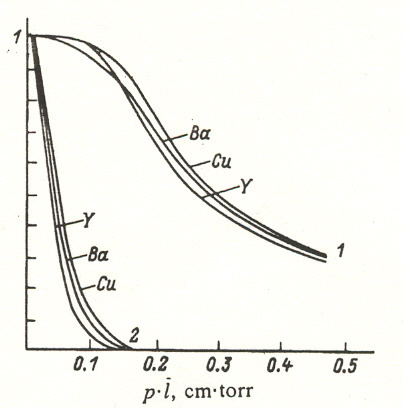 Figure 4 shows the dependence of the transport coefficient of atoms of Y, Ba, and Cu for these conditions, plotted as a function of the spacing between the substrate and the target normalized to the pressure (the reduced spacing). This figure also shows curves that characterize the fraction of Y, Ba, and Cu atoms that have not lost more than 10% of the initial energy ( ~ 1 eV) as a function of the reduced spacing. The characteristic distance at which there are no particles with this high energy coincides with the luminescent flare above the magnetron during the discharge. Depending on the reduced target-substrate distance one can describe the following characteristic cases of deposition of films from a YBa2Cu3O7-δ target. 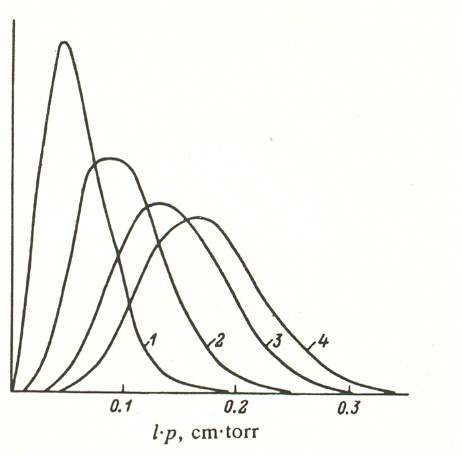 In the region of existence of high-energy ions, L < 0.3 cm.torr, the films that are deposited are superconducting, but with a critical temperature Tc no higher than 70-75 K on SrTiO3 substrates. According to the calculations, at this distance there is nearly 100% transport of atoms from the target to the substrate, but the high energy of many of the atoms that reach the substrate either causes defects in the film or results in the reflection of the atom and its removal without incorporation in the growing film, and thereby the stoichiometry of the transport is disturbed. 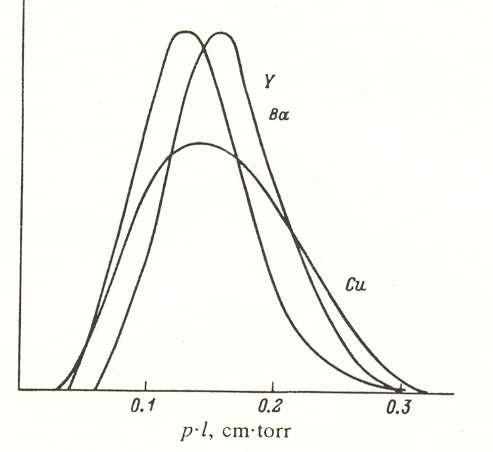 where Li is the mean thermalization length of an atom of the ith species and can be determined from data on the fluctuations in the distribution of the thermalized Y, Ba, and Cu atoms as shown for (Eth/Ei) = 10-3 in Fig. 5. With increasing target-substrate spacing the ratio of the transport coefficients for the different atoms becomes constant. For a stoichiometric YBa2Cu3O7 -δ target one should obtain under these conditions transport of a composition that can be expressed by the formula YBa2.4Cu3.3O7 -δ Accordingly, to obtain stoichiometric films the process may be carried out using an adjusted-charge mixture of composition Y1.2Ba2Cu3.25Ox for the target. Carrying out the deposition with an adjusted charge mixture for the target by means of dc magnetron sputtering has the disadvantage that if the composition of the target departs from stoichiometry its conductivity falls and the stability of the discharge can be disrupted. Moreover, this treatment does not take into account the unavoidable fluxes of sputtering and reaction gases, which can have a substantial effect on the transport coefficients that are actually observed and are characteristic of a specific design of the sputtering system and deposition geometry. Good results are provided by a deposition system in which the substrate is placed parallel to the direction of motion of the high-energy atoms. 12 In this orientation the substrate escapes bombardment by nonthermalized atoms, and if the substrate is located at a distance. less than Li the quantity TCj turns out to be close to 100%. Since the values of Li for atoms of different kinds in the present case do not differ by more than 20%, one can expect stoichiometric transport of the composition of the target when the substrate is located at a distance between Lmin and L from the target. If the crystallites that are nucleated have the same orientation their rates of growth normal to the substrate surface also turn out to be the same and smooth films are formed with a well-formed structure. If the substrate exerts no orienting effect or if there exists large supercooling at reduced temperatures, where the orienting effect of the substrate has little influence during the nucleation, the normal component of the rate of growth of each crystallite depends on its accidental orientation and can vary over a wide range, and consequently the films grow with a rough surface. B. S. Danilin. 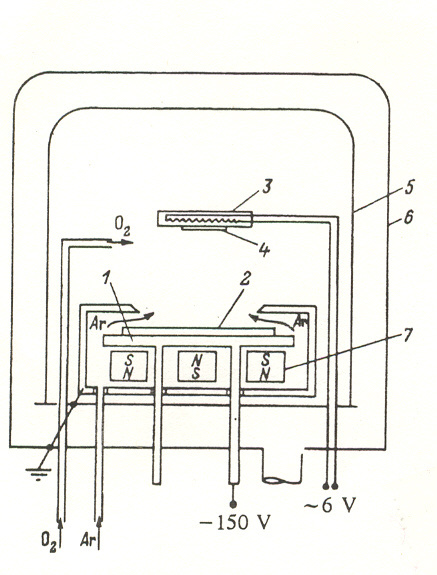 Re\'iews of High-Temperature Superconductivity [in Russian) (1991), No. 1(15). pp. 55-99. 2T. I. Selinder. G. Larsson. and U. Helmersson. Supercond. Sci. Technol. 4. 379 (1991). T. I. Selinder. G. Larsson. U. Hell11ersson. and S. Rudner. l. Appl. Phys. 69.390(1991). S. Yang. P. Wu, Z. Ji. et al.. l. Appl. Phys. 68,2308 (1990). T. Uchiyama. M. Suzuki. and K. Takahashi. Cryog. Ellg. 25(5). 46 (1990). H. C. Li. G. Linker, and F. Ratzel, Appl. Phys. Lett. 52, 1098 (1988). W. Y. Lee. J. Salem. and V. Lee, Appl. Phys. LeTT. 52. 2363 (1988). A. A. Ivanov and L. G. Sakharov. Problems in Mechanics and Mechanical Engineering, Abstracts of a Conf. for Young Scientists, Academy of Sciences of the USSR (1989), No.3. p. 13. N. T. Erofeeva and L. G. Sakharov. "A heating element for vacuum apparatus' [in Russian] . Preprint Mechanical Engineering Institutee. Russian Academy of Sciences. Leningrad (1991), No.2 J 5-91. Yu. V. Gomm and Yu. N. Yavlinskii, Interaction of Slow Particles with Matter and Plasma Diagnostics (in Russian I. Moscow ( 1973). B. S. Danilin. The Use of Low-Temperature Plasma for Deposition of Thin Films [in Russian]. Moscow (J 989). C. B. Eom, 1. Z. Sun, and B. M. Lairson. Physica C 171, 354 (1990). JR. Borman and J. Nolting. Appl. Phys. Lett. 54,2148 (1991). Y. Kubo. Y. Nakabashi, and J. Tabuchi, lpn. l. Appl. Phys. Part 2,26, L1887 (1987). L. G. Sakharov, Processes of crystallization in anorthite-gehlenite and gehlenite-dicalcium silicate systems' [in Russianl, Dissertation, Leningrad (1984). P. F. Rumyantsev and L. G. Sakharov. in: The Structure and Properties of Silicate and Oxide Systems, Ahstracts. Bratislava (1986), pp. 89-91.